I kind of wanted to punch today's challenge in the face. Which is ironic because I came up with it. I knew exactly what I wanted to do but I wasn't sure how to do it exactly!! 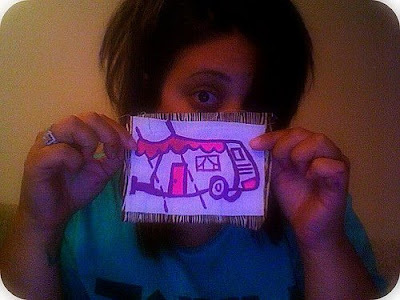 I painted on canvas, I embroidered, I did an illustration and kind of hated them all. Being that it was 9:00 and the deadline was 10:00, I had to figure something out!! The patch is complete with Joel Dewberry wood-grained fabric as a backing. The patch measures about 3"x5". Perfect for a backpack, bag, whateva!! Im not going to post this in my Etsy because I am not completely in love with it but I will send it with whoever purchases my polaroid camera painting!!! Also, if you purchase the polaroid camera painting from challenge number two, I will also send four rolls of deco tape with it :) I love that painting and I really want to see go to a great super-cute home!!! 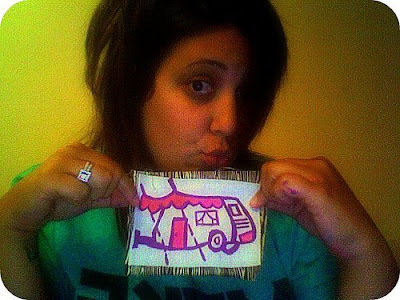 Check out Jamie's super cute embroidery that she made for the challenge today. I love it and I want it!!!! I so want that painting!! But my silly debit card has expired and I am awaiting my new one so that my paypal account can be updated!!! Grrr... I hope it gets here soon before the painting is no longer available!!! I have a polaroid just like that but am trying to find film for it right now! Happy Friday! !